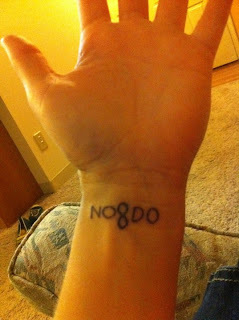 I got a new tattoo yesterday and my friend Maggie wanted me to blog about it. It's actually not an interesting story, but the story of my first tattoo is a bit comical so I'll write about that. It was August 2003 and my friends and I would soon be departing for college. My friend LeighAnn discovered that her mom and stepdad would be out of town for about a week and she'd have the house to herself. She began thinking of things we could do (elegant dinner parties, book clubs, you know--kid stuff). Obviously we were going to have some small parties in their absence, but LeighAnn decided that this would be a perfect time to get our tattoos. My parents knew that I wanted a tattoo. I was 18 and it was my decision. LeighAnn's parents did not know and she did not want them to know. We'd both been 18 for a few months--we're not those kids who ran out on their 18th birthday and just got any old thing because they could. She decided on a small daisy and I decided on a small star. My favorite part of the story is what my dad said before I went, "Make sure that whatever you get doesn't have some other meaning or something. If I find out that whatever your tattoo is actually means something else, I'll turn the stove on and remove it myself." I told him I was fairly confident that a star was just a star but I'd double check at the tatoo parlor. I asked Billy the Tattoo Artist if stars meant anything other than stars and he assured me that they did not. Sweet action. I had also discovered that the base price for tattoos was $40. That's not a lot of money, but it did seem like I should get a slightly bigger tattoo to get my money's worth. My original plan was a tattoo the size of maybe a 50 cent piece...what I got is probably about the size of a sand dollar. I say probably because it's on the back of my hip (*not a tramp stamp) so I don't see it all the time. I have been known to forget it's there, catch my reflection in the mirror before getting into the shower (an already unpleasant experience in my book) and find myself saying, "Ah! What's that?" It's a nautical star, despite my general fear of water. Amy Jo said it made her think that I was in the Navy. But let's face it, when you look at me the first thing you think of is the Navy--with or without seeing the tattoo. Back to the actual process. I was sitting on a chair that was raised up so my hip was more eye level for Billy the Tattoo Artist (that is what I always call him when telling this story). The tattooing begins. Tattoos hurt. Anyone who says different is a dirty rotten liar whose pants are probably also on fire. It's a needling, jabbing you repeatedly at a very high speed. That's a recipe for discomfort. Mind you, I was not under the impression that this would be pain free. You sort of go a little numb to it after awhile; maybe it's the adrenaline or something I don't know (what am I, a doctor?). Another guy who works at the tattoo parlor walks in front of me and says, "Uh-oh, Billy you might want to lower the chair because she's completely white." That's when I realized I hadn't really eaten anything that day, what with all the excitement about the tattoo. Soooo, I almost passed out a little bit. They went and got me a drink, root beer if memory serves and Billy the Tattoo Artist decided that he would not add the shading because he didn't want me to pass out. Tattoos are fairly addictive, but I made sure to pace myself. I have no plans of becoming a highly inked individual. I knew I wanted something else, but I didn't know what. When I was visiting LeighAnn in Los Angeles for my 21st birthday, she suggested we get more tattoos. She got one and I was all ready to go, but their base price was $100 and I figured I could get a better deal back home. After I studied in Sevilla my senior year of college, I knew what I wanted. The motto of Sevilla looks kind of like this: NO8DO. There's a pretty cool story about it, but I don't feel like typing the whole thing (besides I need to eat dinner and get to the movies to watch Harry Potter). You can read the history of the symbol here. In English, the motto means "It [Sevilla] has not left me". I thought it was appropriate as my experience abroad was amazing and it's something that will never leave me. I went to Sevilla in 2006 and yet I just got this tattoo now. I've been able to psych myself in and out of doing it for years. I was afraid that I'd forgotten how much it hurt and that I couldn't handle it. Then, my friend Amy made an appointment to get another tattoo. She wanted me to make an appointment too, but I knew I'd convince myself not to do it if I had an appointment (weird, I know). Instead, I just showed up to the place (fairly confident I would be getting the tattoo). Amy's tattoo was being sketched and Laurel had gone to get Chick-Fil-A so I just went ahead and got my tattoo. The end. Pop Quiz! Which would be easier: finding restaurants with a wide variety of gluten/wheat/rye/egg-free foods or finding an eskimo mermaid who rides her pet water-breathing unicorn sidesaddle through the lost city of Atlantis? Now, I'm not going to give away the answer...but I think you can figure it out. This is just a silly little post...I've made amazing strides since my last post, those whole two days ago. I did some quasi-successful grocery shopping. Not too long after I did the questionable shopping on Saturday, I got my food allergy results back. It turns out I'm highly allergic to a couple teeny tiny things...like gluten, wheat, rye and eggs. The bad news is that those items are in just about everything. The good news is that really limits my range of selection in the grocery store. I'm 26 and still not a real grown-up--and not just because I still say "grown up". I cannot grocery shop to save my life. I still live at home while I'm paying off student loans and saving money so Amy Jo is the main shopper in the house. Not to mention I just finished being on Nutrisystem for a full year so I didn't have to think about food that wasn't mailed to me. What kind of list is that? I've set a new goal: successfully be able to purchase proper grown up groceries by the time I'm 30. The other day I found myself thinking about The Wizard of Oz. Everything was fine until I started thinking about the lyrics to The Merry Old Land of Oz...then it became a bit disturbing. Check out this video--I couldn't embed it for some reason. They sing the song once it's been decided that Dorothy & Co. will in fact get an audience with the Wizard. Then everyone is like, "Hey you guys are a hot mess and we can't let you see the Wizard like that. Let's go to the Wash & Brush Co. where they'll clean you up." When they get to the Wash & Brush Co. the facility seems tailor made for a girl, lion, tin man and scarecrow--like those are the only demographics served at the establishment. The disturbing part is when they're working on Dorothy. Dorothy: Can you even dye my eyes to match my gown? I'm not even going to ask how they make dimpled smiles out of frowns. Had they sung that to me, I would've been concerned. But not Dorothy. Dorothy says, "Hey, while you're at it, how about dying my eyeballs?" What's up with that? Had the movie been made in 2011, Dorothy could've just asked for some colored contact lenses. But the movie was made in 1939 and I'm pretty sure that contacts (or at the very least the colored ones) weren't a thing. Why was that the lyric they went with? It wasn't like this was based on a true story and they wanted to maintain some sort of integrity. It's just a line in a musical. We could've dyed her socks to match her gown or something normal. But no, we dyed her eyeballs. I would think that, had that happened, Dorothy would've had bigger problems than just getting back to Kansas. Uncle Henry and Aunt Em would have been supporting her all their lives because she would've been blind.